When we go to the doctor for a major surgical procedure such as a total knee replacement, we assume our doctor will use the latest devices and techniques. However, we also assume any equipment used will have been subject to clinical trials and approved by the United States Food and Drug Administration (FDA). Unfortunately, according to a recent news article from the New York Times, things don’t always work out so well. One patient interviewed for a story was scheduled to undergo a total knee replacement procedure. When a surgeon performs a total knee replacement, he or she relies on a medical device known as a cutting guide. Much like a carpenter’s jig, a surgical cutting guide is placed on the bone to be cut so the surgeon knows where to apply his or her bone saw. Cuts must be made in the precision location to increase the chances of a proper fit and alignment. If alignment is off, even slightly, patients can have a longer recovery, increased pain, decreased range of movement, and in worst cases, the artificial knee may fail and become loose or dislodged. 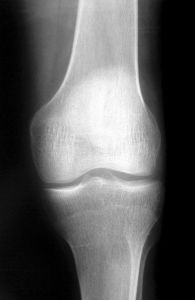 If an artificial knee becomes loose, the patient will likely require another surgery to fix or replace it. If you have had a total knee replacement and your surgeon tells you it will require another surgery to repair the defect, you should contact a Boston knee replacement injury attorney as soon as possible to see if you have a case. While the hospital or manufacturer may pay for the second surgery, or your insurance company covers the cost, you may still be entitled to additional financial compensation for your pain and suffering, lost wages, and other special damages caused by a defective artificial knee. In this case, patient’s surgeon used a cutting guide manufactured by OtisMed for use with its OtisKnee artificial knee. FDA did not approve these guides because when the company submitted its application for approval, it was denied on a basis these devices were not adequately tested to prove safety and efficacy. While this should mean cutting guides were either scheduled for further testing, or taken out of production, company officials decided to ship them to surgeons anyway as if they had been approved. As a result of this, former CEO of OtisMed pleaded guilty to shipping adulterated medical devices during his criminal case. However, his criminal actions were not discovered before OtisMed cutting guides were used by surgeons throughout the country. Surgeons say OtisMed devices were heavily sought after because they were using state of the art techniques to make it easier for doctors to get cuts right. The problem was they had never conducted necessary studies to test these devices and then misrepresented FDA approval when shipping them. As it turns it out, there seem to be serious problems with these cutting guides. The patient interviewed was fine after surgery until later when she awoke in excruciating pain in her knee. She needed a walker to get around, and was unable to work during this time costing her a significant amount of income. As a real estate agent, her income was entirely sales-based.